We love 6 pack coolers. It’s impossible to put on a serious get-to-work face when we’re reviewing them because they’re just so much fun! They aren’t like a Yeti or an RTIC. Even the Kula cooler didn’t give us as much fun as finding the best 6 pack six pack coolers. The thing about the other coolers we review is that they are meant for serious functions. They are intended for when you go out camping, or kayaking, or when you’re going to be out in the fields all day working. We have to take them seriously because our readers will take them very seriously when they’re buying them. 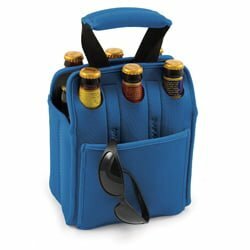 With 6 pack coolers, however, they’re meant for what is a fun activity: carrying your beer! That’s why we even tested the six-pack coolers we reviewed over a few beers, to give it the right ‘atmosphere’. Okay, enough rambling, we’ll get to the point. 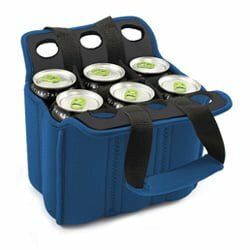 Six pack coolers are a great convenience because they help you keep your beer cool when you’re out there having fun. Whether you’re fishing or golfing, your 6 pack cooler is like a trusty friend that’s always got your back. But there are so many of them in the market that it can be overwhelming to find one that’s got the right blend of functionality, aesthetics, and uniqueness. So we set out to prepare a best 6 pack cooler review where we give you our top picks. 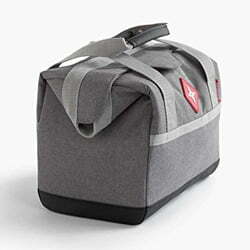 This L&L Brew Works Six Pack Neoprene Cooler bag is undoubtedly fun to have around. It’s designed to be able to carry both cans and long necks without a hassle. 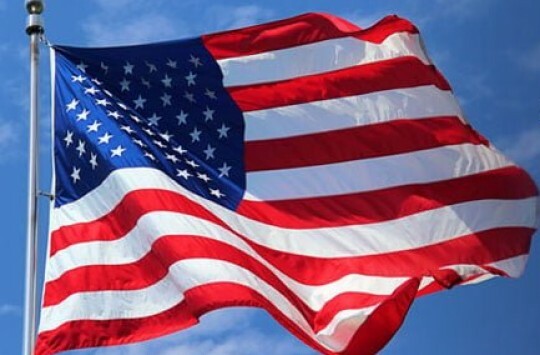 The company was started by an army veteran and a critical care nurse who understand what it means to serve people. Now they’re serving “beer stuff for beer people”. 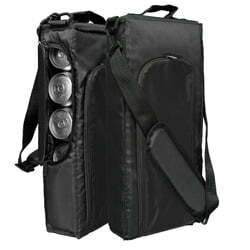 The bag itself is pretty compact, with a few side pockets for your extra and a bottle can opener with its own pocket. There are tough no-stretch nylon carry handles on the top flap to give you a good grip when carrying the bag plus more around the bottom for extra strength. The cooler itself is pretty reliable. 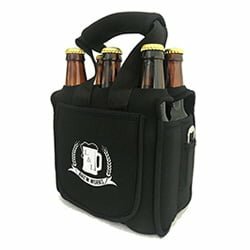 It’s a neoprene cooler, so it’s guaranteed to keep your beers as cold as you want them for hours on end. 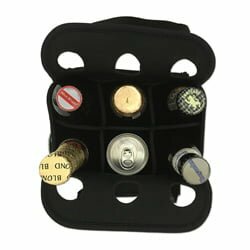 The bottle compartments also consist of neoprene dividers to keep your bottles from clunking together during transportation. We feel like the bag is pretty okay for those who don’t mind showing their beer as they carry it around. It might be a problem, though, if you want the contents of your cooler concealed while carrying some longnecks in there. 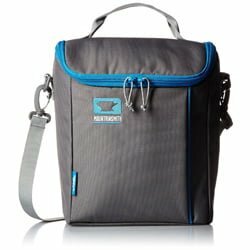 This Barebones Living Trekker Six Pack Cooler Bag is all about using the latest and most excellent technology to make an unbeatable six pack cooler. It is jam-packed with countermeasure after countermeasure to make sure it does what it’s supposed to: keep your beers cold. To start with, it uses Barebones’ signature SmartCool System that combines five layers of protection to keep your beers cooler much longer. It also has the latest reflection technology to reflect heat and UV treatment, so it’s safe even out in the sun. The bag itself is made out of a non-abrasive poly-nylon blend that won’t fray. It has EVA foam in the base to prevent caving and morphing under pressure, so it keeps its shape even when it’s in a cramped space. It’s also entirely waterproof with reinforced stitching at all the seams and zinc alloy zippers. Not a drop of water will be making its escape out of this bag that’s for sure. It’s durable, trendy looking, and it does its job. Top that off with the fact that it has a flexible frame for comfort while carrying and you’ve got yourself a six pack cooler tote bag worth showing off! This one’s unassuming. 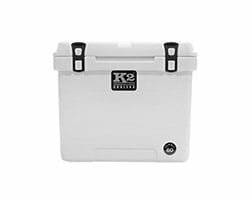 We’d say it’s pretty functional as 6 pack coolers go, and it employs tried and true technology to get the job done. What we loved most about it is the look. It has a simple gray look with a blue zipper. It reminded us of a gray mountain peak set against a clear blue sky in the background. 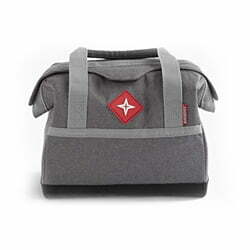 The bag itself is made of 150d baby RipStop Poly and has a barrel top zippered closure. 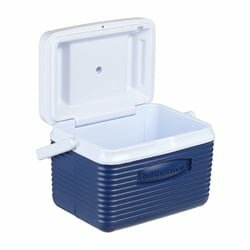 The ice chest is deeper than it is wide, allowing for you to put in your long necks with ease. It features a haul handle for easy carrying and PEVA lining to seal the seams and make them waterproof. All in all, it’s an okay bag if you want something that does the job and doesn’t stand out too much. What else we like about it? How about the fact that it comes in six (coincidence?) different colors/designs. You can check them all here. Picnic Time guys are known for building great products that last a lifetime and make for great gifts. This beverage tote is one such product, and it doesn’t disappoint. Technically, it doesn’t have the Picnic Time logo on it, but the Legacy one. Legacy, however, is a Picnic Time brand, so it doesn’t really matter. 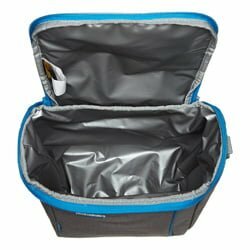 The bag itself is a compact neoprene bag with an interior slot in the ice chest for a cooler icepack. 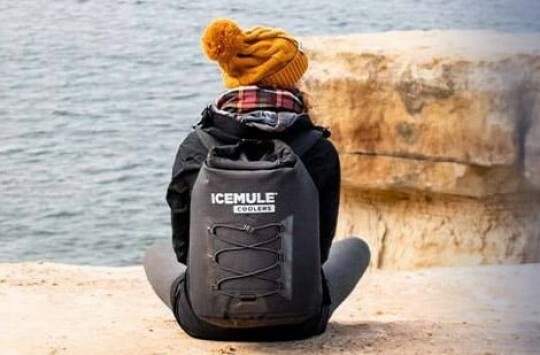 The neoprene ensures it keeps ice cold for many hours and the design is such that your cans or bottles will be separated by neoprene dividers to stop them from clunking around. It also has a handy side pocket for anything extra you might be carrying like your phone or keys. 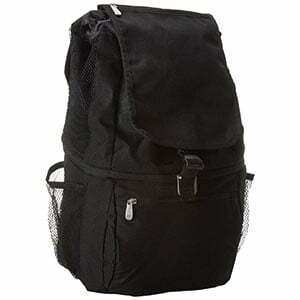 It’s an overall great bag for picnics and parties and will certainly be appreciated as a gift. Mountainsmith are notorious for their functional but straightforward style. They may not be the flashiest of the bunch, but they certainly get the job done. That’s what they do with this fantastic six pack cooler tube. We’ve had a look at cooler tubes before, and we said we thought they are one of the craziest and most creative ideas on the cooler market. We still do, so we naturally have a soft spot for this particular cooler. It has the iconic Mountainsmith gray and blue color scheme that just keeps reminding us of a mountain peak against a clear blue sky (other 6 colors are also available). It has a full-length zippered closure with a fully water-resistant zipper. 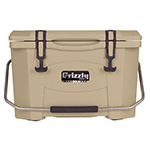 The seams are waterproof as well, with PEVA linings, and the ice chest can keep your drinks cold for hours. It also has an adjustable shoulder sling for easy carrying. Candy Daddy never disappoint with their products and this one is another great product from them. The very kind we have come to know and love. 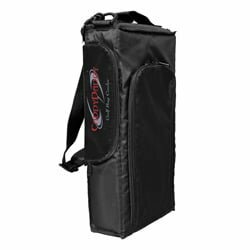 The only thing better than a 6 pack cooler bag is a 6 pack cooler bag that was made specifically for when you’re going golfing and fits golf bags. The Candy Daddy Golf 6 Pack Cooler has a serious look. It’s something that seems to say “I know what I want and I go for it.” After all, knowing golfers the way we do, we believe that anything made for them needs to make a statement along those lines. 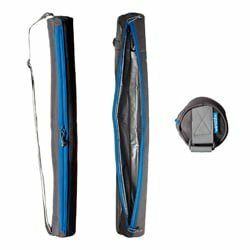 It has a nifty side zipper for easy access from your golf bag, a removable shoulder strap, a heat sealed liner to prevent water seeping through and getting into your golf bag. It even has a side pocket for all your extra golf gear. In other words, it’s a golfer’s dream! This one’s not really a cooler bag. It’s an ice chest for 6 packs. 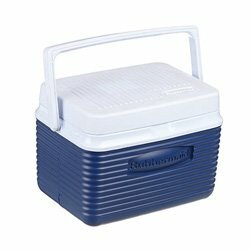 We figure not everyone loves bags (we certainly do), and so some people will certainly appreciate the sentiment behind 6 pack coolers like the Rubbermaid 6 Pack Ice Chest. This cooler certainly does the job, for one. 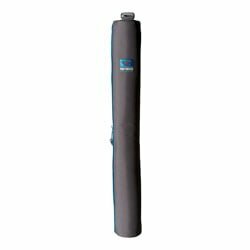 It has superior thermal retention capabilities and is guaranteed to keep your food and beverages cold for many long hours. It can hold 6 cans plus plenty of ice and is resistant to both odors and stains. It has a convenient swing handle for easy carrying and an easy to clean liner. Like we said: it certainly does the job. Tip: Want to know more about Rubbermaid coolers? Read this post. That’s it, folks! We looked at those seven six pack coolers and have decided that our beers will never lack a home while they exist. You’re probably wondering which one we prefer. 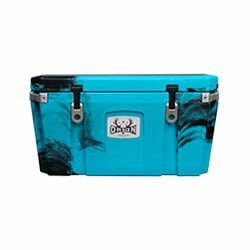 Which is the best six pack cooler? To be honest, even we couldn’t agree on that. They all have something unique about them, apart from the mere fact that they’re six-pack coolers. What we agreed on is that, whichever you choose from the list, it’s certainly going to be an excellent cooler to have! My brother suggested I might like this website. He was once totally right. This post truly made my day. You can not believe just how a lot time I had spent for this info! Thanks!